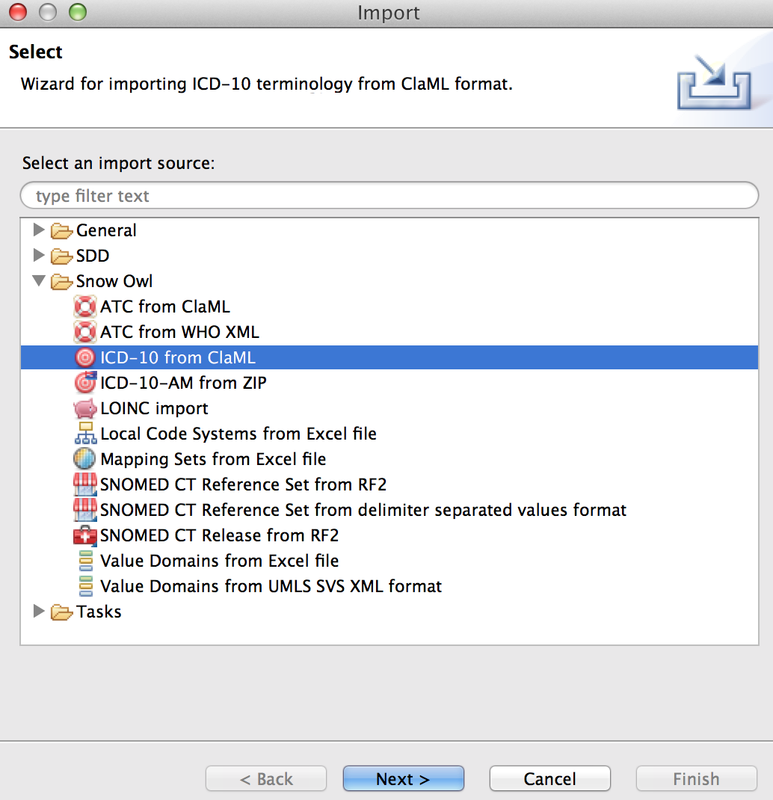 Snow Owl supports importing ICD-10 releases in ClaML format. Please note that due to licensing restrictions, Snow Owl does not distribute the ICD-10 release which will need to be obtained from the World Health Organization. Select Snow Owl > ICD-10 from ClaML from the list, and click Next. On the next page, click Browse to select your file, and Finish to start the import. As importing a new release of ICD-10 will overwrite the previous version, you will be prompted to confirm your command. The import process is fairly quick, taking less than a minute for the full 2010 release. Note: When you are using Snow Owl for the first time, the ICD-10 concepts view might be empty. In this case, you will have to import the ICD-10 release file into Snow Owl as described above. To open the import wizard, just click on the link ( Import ICD-10 from a CLaML file ...) in the ICD-10 concepts view. Snow Owl supports importing the Australian modification of ICD-10. Please note that due to licensing restrictions Snow Owl does not distribute the ICD-10-AM release. To start the import wizard, select Snow Owl > ICD-10-AM from ZIP. The import process is similar to the one described for importing an ICD-10 release. Snow Owl supports importing the (American) clinical modification of ICD-10. Please note that due to licensing restrictions Snow Owl does not distribute the ICD-10-CM release. To start the import wizard, select Snow Owl > ICD-10-CM from ZIP. The import process is similar to the one described for importing an ICD-10 release.